Keith & Peggy – Decided on Forever. There’s one of my ‘favouritest’ set (is there such a word?) of Prewedding. It was a pretty boiling HOT day but hey the sun was golden! I had such fun. ^ Tiny Detail tells a story too.. every petal, every smile and the Gown’ delicate patterns..
^ This is my favourite-est-est photo in the whole series. I shall try my best to explain..
here’s something a little different from the usuals.. Sparkles Flying.. Quite literally! And lastly, here’s me and the Couple.. Oh and the ‘Unseen Heros’ of the shoot, the assistants. =D Big Thanks..
Oh also, I had made a tiny behindTheScene video of this lovely shoot on my Facebook, You might be interested in seeing how ‘Bubbles are Made’. Click HERE! I had the pleasure of shooting Colin & Lyana a while back. I like to think of the shoot as rewinding the TimeBar because we had a shanghai theme where Lyanna don the most gorgeous QiPao. I think to carry out a QiPao, not only do you need a slender frame, there’s a certain feel to it too. Womanly? Graceful? Whatever magica it is, I think Lyanna brought it out very well. Colin is great too of course. Heh. Forwarding the timebar, we went back to where the couple knew each other. NUS.. 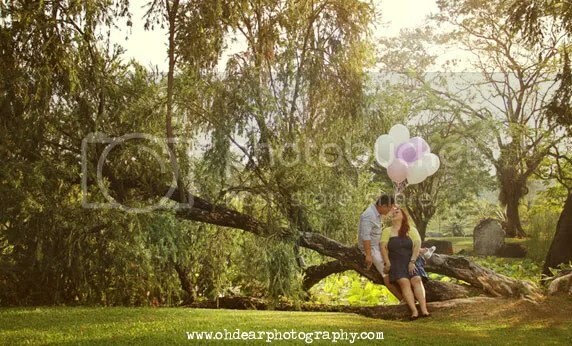 So here’s their very lovely and serene Engagement Shoot. Enjoy.. I cant believe 3/4 of 2011 had passed when I still feel that 2010 is the future.. What’s wrong with me. Trapped in a TimeWarp thats it.. anyway, a tiny “annoucement”, we are fully booked for whole of this year2011.. In fact, we had been fully booked and had closed bookings couple of months back.. 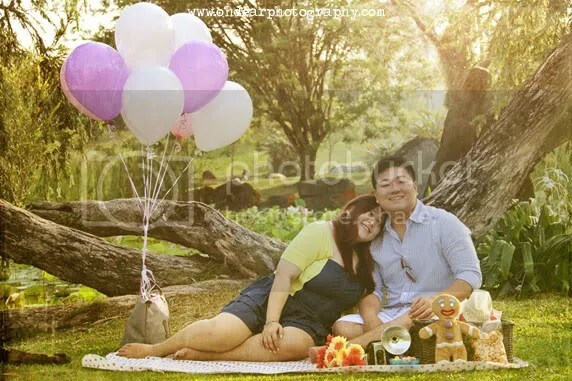 I would be going to Bali this Nov for a prewedding shoot. yes im extremely excitied! meanwhile, here’s a beautiful shoot from last weekend.. Wilson & Nara.. These are just Sneak peeks, I have yet to finish the whole album. But Im excitied.. me think its gorgeous!! ;D! Recently I been shooting alot at Botanic Garden and nope, to answer your questions, im not “sick of shooting there” as opp to what you might think! (alot of my couples ask me the same thing. hahaha) Greens are.. erm ever-green, classic! They would never look outdated so yup, that would be my answer. And of course, Kenneth & Jessie sweeten the place alot. I though they look very sweet together. and oh yes, it was extremely funny the way kenneth was carrying a bowl of biscuits and randomly feeding the fishes in the ponds as we were strolling through the garden. LOL. so enjoy the pictures peep. 😉 and have a great week ahead!! Shuwen & YongHeng – not unlike a Painting.. Some couples are beautiful, some are serenely-loving and some are just pure cuteness. ShuWen & YongHeng ‘s in the Cute Department. we went to the beach, the forest and the tracks..
and Oh Yah, one word of advice to you lovely peeps, if you are thinking of having balloons for your shoot, yes Helium ones look pretty, but they are might troublesome. They last only say 10-12hours, so you would have to either get them very late the night before shoot, or very early before the shoot.. and, they always go insane during the shoot whenever there’s the slightest breeze. So I would advice getting balloons on stick. Not only can you blow them up yourself (save some pennies! ), they are easy to manage during a shoot. So yes, bear that in mind oh! =D! meanwhile, enjoy the pictures and have a lovely weekend loves! Felicia and James are the last Couple I took to the now-history-KTM railway station. My couples always ask me what is the best time for shoots.. Well in my case, I would say Morning! As early as possible! Yes I know I know, it kills me to wake up at 6am too (shoot is 8am!) but the morning sun is really gorgeous.. and the greens are always dewy and shiny with morning dews.. Beautiful. So anyway, enjoy this shoot peeps. I always always try to make our shoots as personalised and as meaningful as possible. Recently, I had took to requesting small writeups from my couples.. so that I can know them more. Many of them share with me their story such as how they met, some funny incidents etc. Which I LOVE. I mean, its real-time, true-account love story, (not some unrealistic korean sappy drama).. so whats there not to like about? 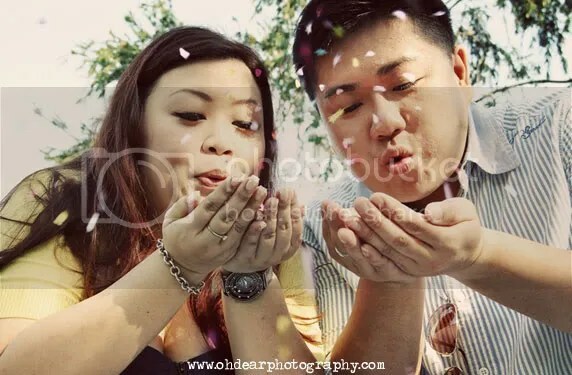 Here’s their Engagement, taken right in the middle of RafflesPlace, right on a monday morning. =D! and also, im sooo sorry for the lack of updates here. ’cause I had been so swamped recently.. Im back to shooting only on weekends (and hence the limited slots) and working fulltime.. so if you would like to look at more vintage-goodness, do follow us on Oh,Dear! Facebook. I do update there more frequently. Your sister is your first friend in life. Even if you don’t get together/talk as much as you could, she’ll always remain your best friend. Your sister will hold your hand for a little while, but will hold your heart for a lifetime. And I am so glad i have 1. I used to quarrel and fight with her a lot but things has since been lots better after me moving out. but yes, we do still bicker frequently enough but I guess it’s for fun sake! heh. and here’s a shoot to celebrate Sisters, Youth and Sunshine. done together with my cousin-Geraldine. it was an impromptu shoot but still fun enough. p/s. 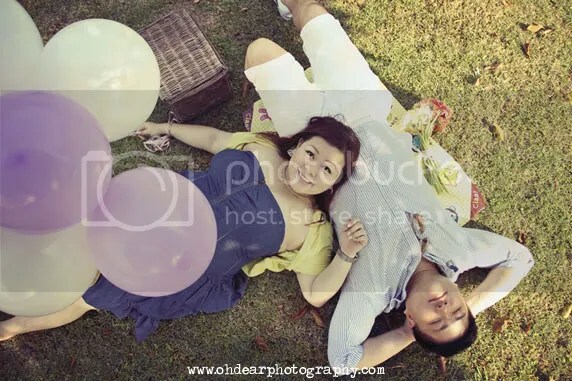 Do contact us ohdearphoto@gmail.com if you would like to have a session with your sis! what with the trillion GBs of hardisk of today, film and photos (real hardcopy photos) are being gradually forgotten and forsaken. People are storing their photos and memories inside discs and seeing them through the screen. Nothing wrong. But the old-soul me still VERY much prefers a real photo. One which I can hold in my hands, one which I can touch and one which my tears can stain.. I am not good with words so I can’t express exactly WHY I would take a 4R size photo over a 5000px softcopy image anyday. But here’s Chelsey and Adrian, looking through the album. One which they can hold, flip and touch..
More then Often I’m being asked what is the best time for photoshoot. My answer might be right, could be technically wrong.. but its always “MORNING”. Yes I hear the groans.. but please believe me~ Morning lights are the prettiest, it’s also cooler around early morning and most importantly, it’s NOT crowded everywhere! I have here with me today a mini-post.. of James & KaiLing & Heidi, taken early in the morning. Fresh, awake and Cooling! and here is a unique Cinemagraph from the same session..